Dust particles form as dying red giant stars throw off material and become part of interstellar clouds of various sizes, densities and temperatures. his cosmic dust is then destroyed by supernova blast waves, which propagate through space at more than 6,000 miles per second (10,000 km/sec)! Observations with SOFIA, however, tell a different, mysterious story -- revealing more than 10 times the dust expected. This suggests that dust is much more abundant in the wake of a blast wave than theories estimate. SOFIA's observations of the iconic supernova suggest dust may actually be forming in the wake of the powerful blast wave. These results are helping astronomers solve the mystery surrounding the abundance of dust in our galaxy. "We already knew about the slow-moving dust in the heart of 1987A," said Mikako Matsuura, a senior lecturer at Cardiff University, in the United Kingdom, and the lead author on the paper. "It formed from the heavy elements created in the core of the dead star. But the SOFIA observations tell us something new about a completely unexpected dust population." Supernova 1987A has a distinctive set of rings that are part of a cavity created in an earlier, pre-explosion phase of the star's evolution. The fast-expanding blast wave has passed through these ring structures. Astronomers thought that any dust particles in these rings would have been destroyed, but recent observations from SOFIA show emission consistent with a growing population of dust in the rings. 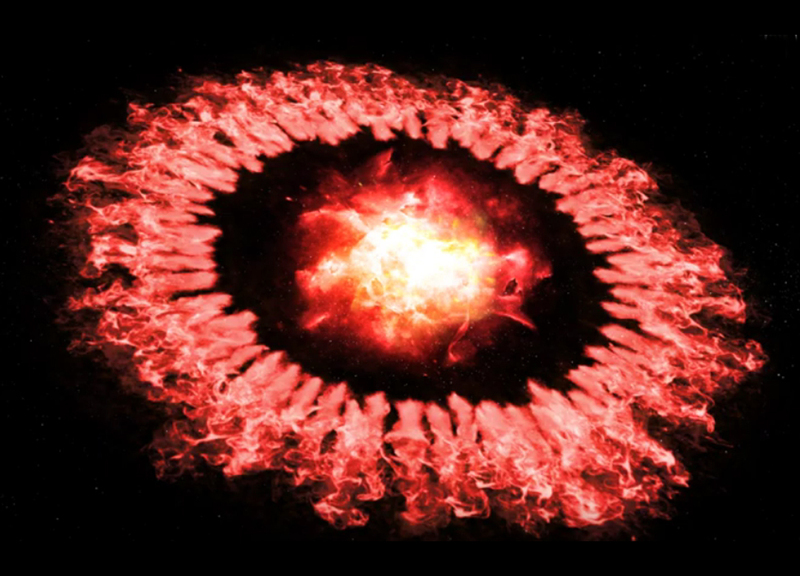 The results indicate that dust particles can re-form or grow rapidly, even after the catastrophic damage caused during the passage of the blast wave, suggesting that although this might be the end of a chapter in the life cycle of dust, it does not appear to be the end of the story. The dust detected by SOFIA could result from either significant growth of the existing dust particles or the formation of a new dust population. These new observations compel astronomers to consider the possibility that the post-blast environment might be ready to form or re-form dust immediately after the blast wave passes -- a new clue that may be pivotal in resolving the discrepancy between dust destruction models and observations. From ground-based telescopes on Earth, observing cosmic dust particles in the infrared is difficult -- or impossible -- due to strong absorption, primarily from water and carbon dioxide in the Earth's atmosphere. By flying above most of the obscuring molecules, the airborne observatory SOFIA provides access to portions of the infrared spectrum not available from the ground. In particular, SOFIA's Faint Object infraRed CAmera for the SOFIA Telescope (FORCAST) is a powerful instrument for understanding warm dust in particular. "FORCAST is the only instrument that can observe at these critical wavelengths and detect this newly-forming population of warm dust," said James De Buizer, the USRA manager for science operations at the SOFIA Science Center and co-author on the study. "We plan to continue monitoring with FORCAST to gain more insight into dust creation and evolution in supernova remnants." In the future, NASA's James Webb Space Telescope will examine this dust in further detail, looking for clues about its origins and composition. SOFIA is a Boeing 747SP jetliner modified to carry a 106-inch diameter telescope. It is a joint project of NASA and the German Aerospace Center, DLR. NASA's Ames Research Center in California's Silicon Valley manages the SOFIA program, science and mission operations in cooperation with the Universities Space Research Association, or USRA, headquartered in Columbia, Maryland, and the German SOFIA Institute (DSI) at the University of Stuttgart. The aircraft is maintained and operated from NASA's Armstrong Flight Research Center Hangar 703, in Palmdale, California.